Please note that Redeemer Busan is moving to a new location effective Sunday, September 30, 2018! See below for the new location information. The closest subway stop is on Metro Line 2 (green line) at Millak. Walk approximately 2km down the river. This is quite scenic, and there is a raised walking path most of the way. Take bus #210 from Millak station to Lotte Castle Giant Apartments. This bus runs every 15 minutes. The bus leaves from just behind the exit 1 stairs (stop #14-031). The bus ride is 3 stops and takes approximately 9 minutes; get off at Lotte Castle Giant Apartments (stop #14-021). Cross the road at the crosswalk, turn right, and walk towards the corner. Turn left and walk 1 block to the building RICC is located in (see photos below for reference). 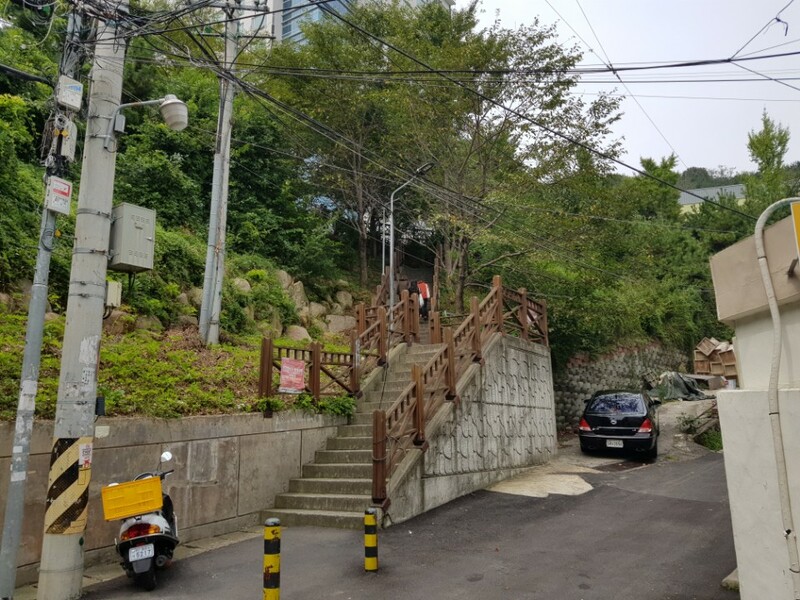 To return to the subway after service, catch the bus on the opposite side of the road from where you got off (stop #14-100) and take it 3 stops to Suyeong Hyundai Apartments (stop #14-030). Walk to your left to go in entrance 2 of the subway station. Go out exit 1, do a u-turn and walk behind the subway exit. There is an electronic sign board showing the estimated time of arrival for the next bus. Take bus 210 for 3 stops (about 9 minutes). Get off at Lotte Castle Giant Apartment. Cross the road, turn right, and walk towards the corner. Redeemer is one block down on the 3rd floor of the Sky Building. The outside says “MEGAFREE” and the building is next to Angel-in-Us Coffee Shop. The first floor has a Blueberry Convenience Store. We meet in the Vision Hall inside the Nuri International Dormitory II building at Kyeongsong University. Reference: Kyeongsong University Campus Map. We are in building 24 (C) on this map. There is no bus service through the campus to the building we meet in, so you will need to either walk (483 meters from the subway) or take a taxi. It takes approximately 5-7 minutes to walk from the subway/bus stop. The closest subway stop is on Metro Line 2 (green line) at Kyeongsong University & Pukyong National University (경성대/부경대역). Come out exit 6 of the metro and turn right at the first intersection (at Adidas). Take the second left, then follow that road as it turns to the right. Turn left and then follow that road all the way to the dormitory (there are stairs which shortcut the final road bit). NOTE: Detailed photo directions are found below for reference. Come out Exit 6 of the metro. Turn right at the first intersection (in front of Adidas). Follow the road as it turns to the right. At the top of the stairs, you will be outside the dormitory buildings. Go in this entrance of Nuri International Dormitory II. We meet in the Vision Hall on the main floor of the building.